A prize-winning five section stand, conveying the journey from Volunteer to Apprentice Fire Officer. 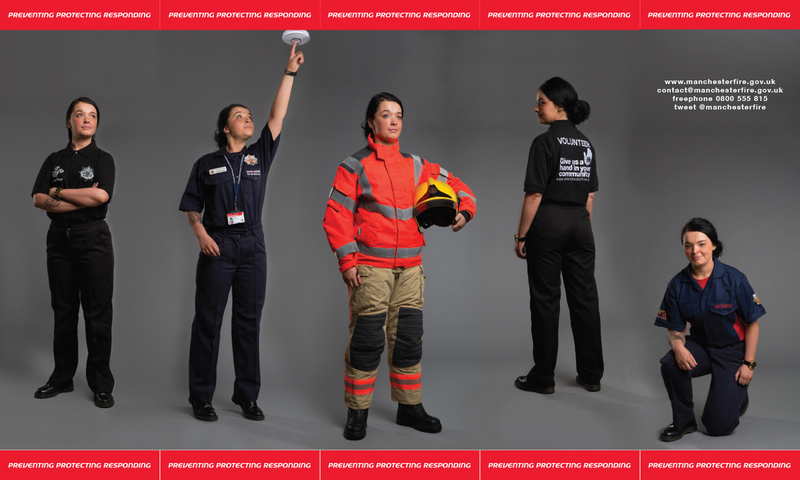 Greater Manchester Fire and Rescue Service (GMFRS) needed a stand that would grab the attention of young people considering joining the service. They wanted to highlight how a recruit could progress from volunteer to a full serving Fire Officer. New uniforms had just been designed for the service, so it was a great way to show the progression through the different stages of a recruit's career. I designed the layout of the stand, directed the photo shoot and built the artwork in five standalone sections that would give versatility to use the stand in different settings. The stand won 'Best Stand' at that year's Labour party conference, and continues to be used at recruitment events and meetings.